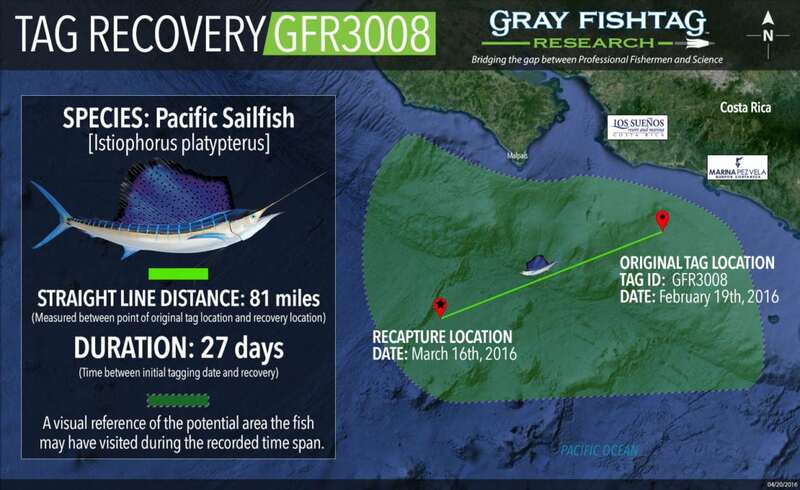 The Pacific Sailfish (Istiophorus platypterus) named “Dash” (Tag ID: GFR3008) was originally tagged & released by angler Dan Hess on February 19th, 2016. Dan was fishing with Captain Jody Whitworth (GFTR Board Member) aboard the boat III Amigos, out of the Official Research Center Los Sueños Resort and Marina (http://www.lossuenos.com/), located in Playa Herradura, Costa Rica. The Sailfish was estimated to be 65 inches (165.1 cm) total length and had an estimated weight of 50 pounds at the time of release. Pacific Sailfish are characterized by an enlarged dorsal fin which forms a “sail”. The body has a dark blue dorsal side and silvery white bottom side, with approximately 20 bars of light blue spots running vertically along the body. Pacific Sailfish generally inhabit the surface oceanic waters offshore with frequent movement into nearshore waters. They are often considered less oceanic compared to other billfish species. This tag recovery is a great example of the collaborative work of fishers from all sectors. The Sailfish was tagged by recreational anglers aboard a charter boat from the GFTR Official Research Center, Los Sueños Resort and Marina, located in Herradura, Costa Rica. The Sailfish was then recovered by a commercial fisherman and reported to another GFTR Official Research Center, Marina Pez Vela located in Quepos, Costa Rica.